At 978m (3210ft) Scafell Pike is the highest mountain in England. On a fine day, there are spectacular panoramic views from every direction taking in all the greatest Lakeland peaks; and the numerous routes up this popular giant give various potential options for an excellent days walking. The summit of Scafell Pike is also the summit of England. Upon completion of this challenge you can say you've stood at England's highest point. In spite of this great claim the summit plateau appears barren and completed covered with grey rubble-like stones, leftover ignaceous rock as part of the boulder field which is evidence of the mountain's volcanic history. This terrain makes for uncomfortable walking but if the sky is clear participants will be rewarded for their efforts with unforgettable views and a great sense of achievement. From a logistical point of view, this challenge is best undertaken by following the Corridor route which begins at Seathwaite Farm. This route is 6.5km longer than via Wasdale Head and Lingmell Col and although it makes for more demanding walking, scenically it is far superior and avoids many of the 3 Peaks crowds who opt for the shorter route as a general rule. Starting from Seathwaite Farm in Borrowdale Valley, our walk leads up via Sty Head Tarn and along the Corridor Route. This is scenically one of the best routes to take up this grand mountain by scaling the western slopes of the range at mid height. Passing by a number of gills the path joins Lingmel Col close to the summit for the final ascent. There is a choice for the return leg: either going the way you have just come or taking a different path between two formerly named Scafell Pikes, now known as Broad Crag and Ill Crag respectively. This route leads towards Great End, the furthest northern summit of the Scafell range, and descends by Grains Gill back to Seathwaite. Arrive in the Lake District (pick up from Penrith Rail Station optional at extra cost) and spend an evening in Keswick. Stay at a local bed and breakfast. Get up early the next day and have a hearty breakfast. Meet the guide and then travel by minibus down to Seathwaite Farm in Borrowdale to start the challenge. You will climb Scafell Pike via the longer route, heading up along the corridor route and coming back down via the grains gill. Transfer from/to Penrith Railway Station to/from Keswick accommodation can be arranged at extra cost. 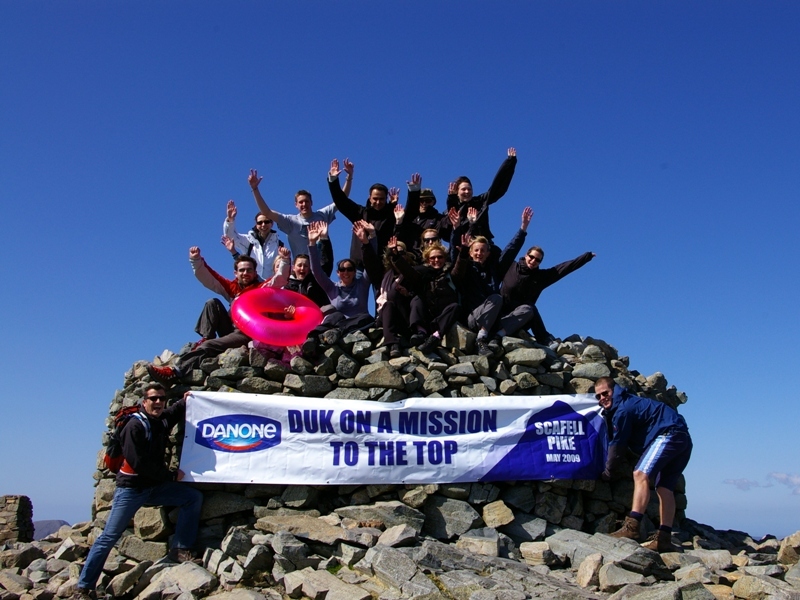 In May 2009 Tony from Activus Outdoors planned and executed a superb challenge for the Danone UK marketing team - to conquer Scafell Pike in the Lake District. Tony's team made sure the event was a team focused challenge, ensuring that even those who were less physically able enjoyed the experience. His excellent organisation and people skills combined to produce a memorable experience that helped our team get to know each other and themselves better.